This listing is for a PDF pattern, instantly downloadable after purchase, so you can start stitching right away! 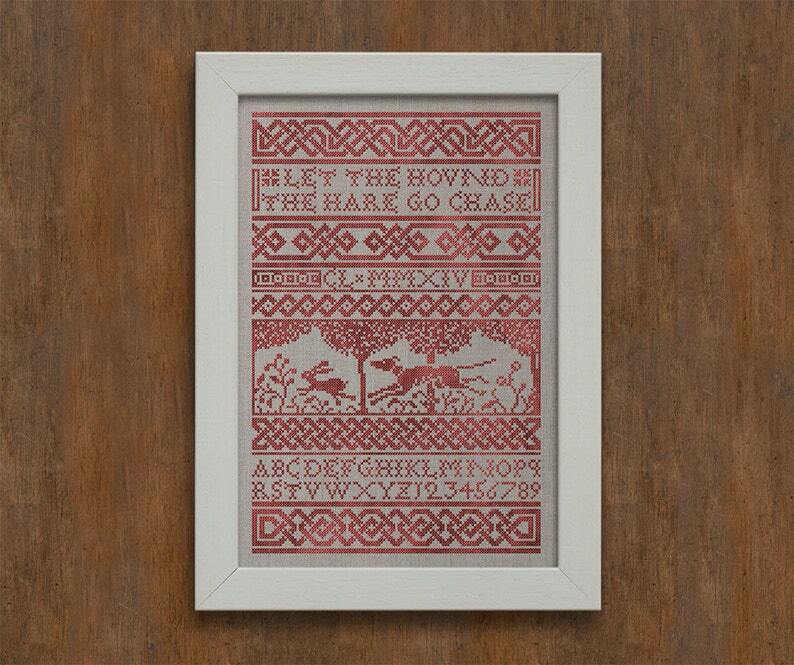 Recently a dear friend asked whether I had any patterns with greyhounds or Celtic borders. I liked the idea, so I created this sampler pattern as a Christmas gift for her. It features several Celtic running knot patterns, as well as a little scene of a greyhound chasing a hare through the woods. The line "Let the hound the hare go chase" is from 'Aglaia: A Pastoral', by Nicholas Breton, written in the early 17th century. I personalised this sampler with my friend's initials and the year 2014 in Latin numerals, but you can change it with your name, initials and year in whatever way you prefer! As is usual with old samplers, the J and U are missing from this sampler, and can be substituted with both I and V respectively. The British isles and the Celts have a long history with the greyhound, which continues up to this day. Dog racing is still popular, but unfortunately has a darker side. I would like to take this opportunity to ask you to have a look at Greyhound Rescue West of England (http://www.grwe.com). It is the leading independent charity operating in the field of rescue, rehabilitation and rehoming of unwanted, abused or abandoned greyhounds and lurchers. 25% of the money brought in by this pattern is being donated to the GRWE. Thank you for your support! This pattern is 179 stitches high and 117 stitches wide. Stitched on 32 count belfast linen (available in my shop), this pattern would measure approximately 11 1⁄4 by 7 3⁄8 inches (28.5 by 18.5). Fast pdf delivery. Since I own a greyhound I had to order this chart. These charts are very easy to read and to follow. Love your designs. Love this pattern. Customized the lettered sections with my retired racer's ear tattoos. I accept payments through PayPal - these are cleared immediately, which means that your downloads will be available instantly! You can also pay with all credit and debit cards through the Direct Checkout system on Etsy, so a PayPal account is not required. Unless there is an actual problem / error with the file, refunds are not given on digital downloads as they cannot be returned to me. However, I want you to be happy with your pattern, so if there are any issues don't hesitate to contact me and I will try and sort it out as soon as possible. Might you receive a physical item that is damaged or that you feel wasn't as described, get in touch with me and I can see what I can do for you. If I can't replace the product, a refund will be issued on return of the item. I'm always interested in exiting commissions, so don't hesitate to get in touch with regards to those.